lived in mud beneath the earth. 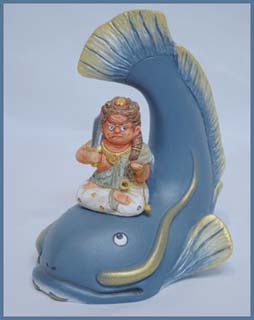 The catfish liked to play pranks and could only be restrained by Kashima, a deity who protected the Japanese people from earthquakes. So long as Kashima kept a mighty rock with magical powers over the catfish, the earth was still. But when he relaxed his guard, the catfish thrashed about, causing earthquakes.
. The Super Earthquake March 11, 2011 . Thus the catfish plays a special role in Japan, where earthquakes are rather frequent. Der Wels und die Erdbeben.
. WKD : catfish ( Silurus asotus) KIGO .
. 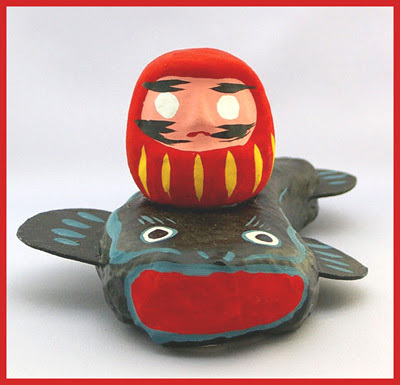 The Gourd, the Catfish and Daruma . An old man stands in the middle of the sea and keeps a catfish down with a gourd. This is a karakuri ningyoo からくり人形　mechanical doll. The man and the fish of the miniature are made from folded paper. 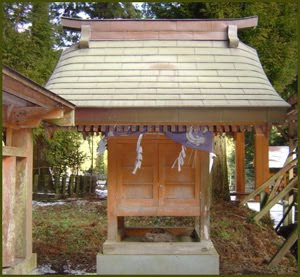 The festival is held on May 14, 15 at the shrine Hachiman jinja 八幡神社. 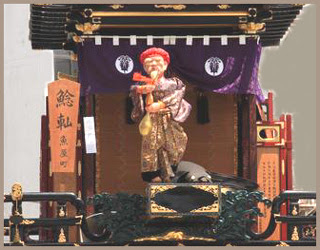 The festival float is called namazu dashi なまず山車, one of the oldest floats to feature a mechanical doll device. 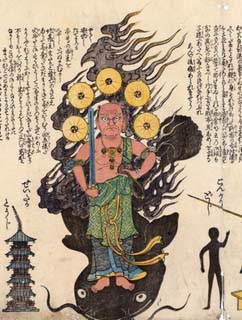 The motive is taken from the Otsu pictures (Otsu-e 大津絵) , showing how powerless humans are against nature (earthquakes).
. 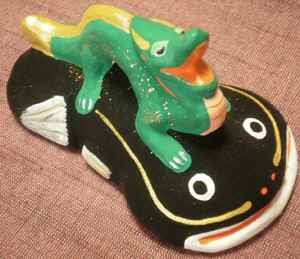 Folk Toys from Gifu .
. Otsu Paintings 大津絵 .
. 2012 - The Dragon Art Gallery .
. namazu nori no saru なまず乗り猿 monkey riding a catfish .
. Daruma on a namazu catfish fish . 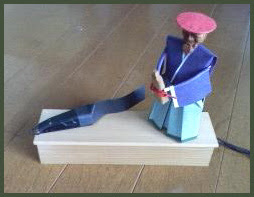 This is the most typical regional toy from Tochigi. Once upon a time, the young farmerboy Sakichi 作吉 found a young namazu during a terrible drought lying way beside the riverbank. So he picked the anmial up and threw it back into River Uzumagawa. It began to rain immediately after his good deed for the next three days. Some years later, the young son of Sakichi fell into the river while playing near the bank. People rushing out to help saw the struggeling child being saved from drowning by being supported on the backs of more than twenty catfish. To honor the benevolant catfish of this river, the farmers made simple toy catfish out of a rice ladel (shamoji しゃもじ) , which they gave to their children when they were born, to protect them from drowning. Prayers were also offered to the catfish, now seen as a messenger of the deities, for the healthy growth of the children and for the protection of their rice fields. 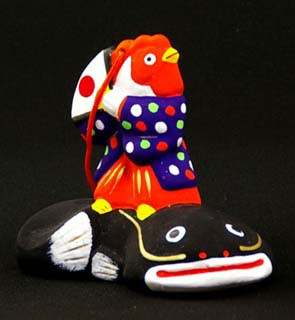 These catfish toys are now a symbol of the spirit of helping each other (taskue-ai), which was very important after the big earthquake of Tohoku in March, 2011. The toys show a black catfish with a large red tongue. The catfish lives in the many swamps of the Kanto plain and was a symbol for the fertile fields of the region. But it did not taste well and was usually not eaten, but lived side by side with the farmers.
. Folk Toys from Tochigi .
. Shamoji ... しゃもじ ... Ladle . they are from 鹿島町 Kashima Machi district in Edo, which is written on the bucket of the fire brigade on the very right.
. Namazu sama なまず様 the honorable catfish . Once, there lived a huge snake that came out at night to kill people from time to time. A parent and child were fishing on a boat one night when the snake came upon them. Praying to heaven for help, the two of them realized after a while that all was quiet. However, there was a large namazu with a swollen belly lying on the shore. On cutting it open, they found the snake inside. The local villagers held a funeral for the namazu and forbade the eating of namazu out of gratitude, which became the pledge of the Yodohime Shrine. 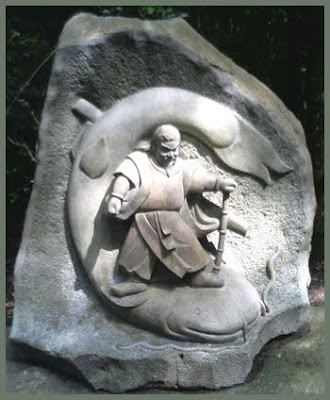 There are three large stones in the shape of namazu near Futsukaichi, which are supposed to have originated from the three pieces into which a giant monster namazu from the Kankō Suki River was cut. During the dry season, rain-prayer ceremonies are performed at these stones, which are washed with rice wine. According to local stories, no namazu occurred in earlier times in a certain well (the stone-well, ishi-ido) located in the immediate vicinity. In the summer of 1873, a fire was built near the three stones, causing them to split in places and namazu that now populate the well to spring from these openings. During the mythical origins of the Aso plain, northeastern Kumamoto on the island of Kyūshū. The plain was once a muddy lake. The god Takeiwatatsu 健磐龍命 inspected the lake and determined that the plain it occupied would be extremely good for growing rice. He therefore decided to drain the lake by allowing the water to run off a hole in the ground on the western end of the lake. Next morning, Takeiwatatsu inspected his handiwork from a height near Teno 立野 to the northeast of the lake, but found only half the water gone. The cause of this was immediately perceived as a giant, thousand-year old namazu blocking the water by lying across the plain. The giant fish had wrapped its barbels around a pine tree and to the south, its tail thrashed in one of the highest peaks of the Aso plateau. After some pondering as to how to get rid of the fish, Takeiwatatsu tied its nose with an enormous vine and tied it to a huge rock near the village of Katasumi. The monster writhed in pain and blows of its tail were felt in Hebi-no-o, 3.5 ri (13.5 km) away. The giant namazu eventually grew exhausted and could struggle no more. Since it was too big to remove, Takeiwatatsu cut it into three pieces and let them fall to the west to be carried away by the waters there. The pieces finally came to rest near a small place in Kamimashiki County, which has since been known as Namazu. The pieces were packed in six baskets (rokka), and the village in which this was done is still called Rokka　六荷　・六嘉. When the time came to use the plain, it was found that rice did not grow well there after all. 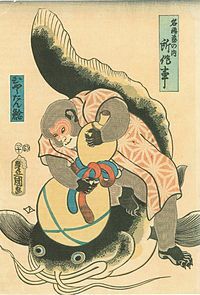 After consulting with his heavenly colleagues, Takeiwatatsu found out that the namazu, as god of the lake, had cursed the rice crops. Takeiwatatsu then made peace with the namazu-god by worshipping his spirit in Teno and since then, rice has thriven in the Aso plain. 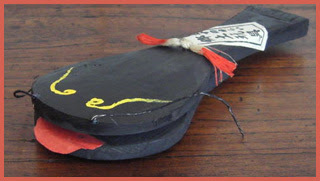 Right up to the Meiji Restoration, the adherents of the Aso shrine neither caught nor ate namazu as a result. 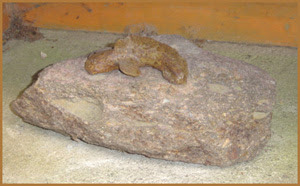 and the stone catfish venerated at this shrine. There was once a temple in Kyōto (the Kamitsu Izumo temple) which suffered from chronic neglect by its priests that it was on the verge of collapse. 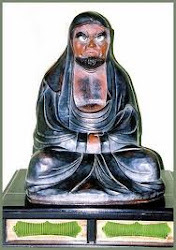 One such priest, Jōkaku, was the son of the previous priest and was married with a child. 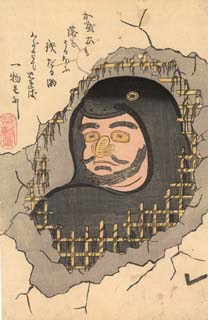 One night, Jōkaku's father appeared to him in a dream and told him that as a punishment for his sinful life (the father's, not Jōkaku's), he had been changed into a three-shaku (91 cm) long namazu, doomed to live henceforth in a narrow dark place under the roof of the temple, in which rainwater entering through holes in the roof, had collected. The father then foretold that a heavy storm would occur the day after tomorrow and the temple would collapse. He would fall to the ground and when that happened, Jōkaku was to protect him from the children, carry him to the Katsura River and throw him into the water. Jōkaku told his wife of the dream and both of them laughed at it. At the predicted time, a wild storm indeed arose, causing the temple to collapse. 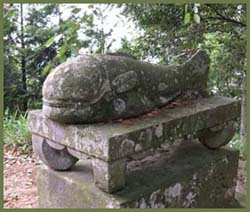 When the temple roof fell in, many large fish fell with it, including a three-shaku long namazu. When neighbors and children hurried to pick up the fish and carry them away, Jōkaku had forgotten about the dream. He drove a stick through the namazu's head and told his son to hold it. Due to its size, they cut the namazu into pieces, put them in a bucket with the other fish and took it home. 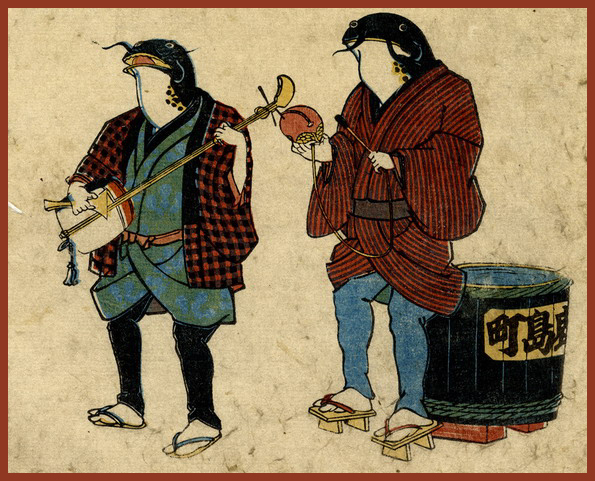 Jōkaku's wife saw immediately that this was the fish of her husband's dreams, but it was cooked in spite of her protests. It tasted strange and just as Jōkaku was inviting his wife to eat some of it, he choked on a bone and died instantly. The numazu catfish had taken its revenge. An Interpretative Approach to Some Aspects of Japanese Folk Religion.
. My Fudo Myo-O Gallery .